Dreaming of purchasing your dream lakefront property? 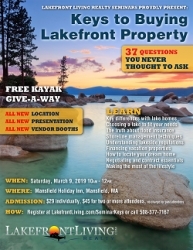 Learn why buying a lake home is different than any other real estate at the 12th Annual “Keys to Buying Lakefront Property” Seminar in Mansfield, MA on March 9, 2019 and you may leave with a free stand-up Paddleboard. Mansfield, MA, January 12, 2019 — For many home buyers, the chance to own a home on a lake is a once-in-a-lifetime opportunity. To help educate buyers so they can make that big decision an educated and informed one, Lakefront Living Realty, LLC, a Mansfield, MA-based brokerage that specializes in properties that are directly on lakes, is hosting its popular “Keys to Buying Lakefront Property” on March 9, 2019. The event, which will be held at The Mansfield Holiday Inn in Mansfield, Massachusetts, runs from 10:00 AM to 12:00 PM and is close to outstanding amenities including Patriot Place (featuring Bass Pro Shops), the Xfinity Center and the Wrentham Outlets. In addition, several “lake related” vendors (boating, docks, financing, etc.) will be on hand to meet with buyers. Admission to the seminar, which sells out every year, is $29 and seating is limited to the first 150 people. All attendees will be entered into a drawing for a free Stand-up Paddleboard showcased at the seminar ($600 value). The winner will take it home the same day. To register or learn more from the seminar FAQ’s, visit https://www.lakefrontliving.com/ma/seminar-keys or call 508-377-7167.